Weeks ago, Microsoft have released their own anti virus software, Microsoft Security Essential (MSE), as posted in days ago, which basically a stripped down version of the OneCare product that Microsoft decided to stop the development “is built to address market changes and consumer needs and includes real-time antivirus, antispyware and core anti-malware functionality while utilising fewer computing resources.“, according to the spokeperson of Microsoft . While it doesn’t really provide full protection of computer to all range of users, but it can be quite adequate if it going to be used along with other free anti-adware/malware software. I can’t deny that a full suite of internet security is really well enough, especially with the price drop nowadays, but it still depends how you use your computer. I had used Kaspersky Internet Suite before, function wise is all ok, but it delayed my computer startup to 2-3 minutes which is unbearable for me. Thus I still prefer a separate software for anti virus, anti malware, firewall etc. Isn’t the interface simple and clean? Only 4 main pages which are simple yet highly customizable. Home page – You can check your real-time protection status, virus definition status, scheduled scan settings, and initiate a scan whether a quick one, full one, or custom one. Update page – You can have your MSE check online for any updates on virus and spyware definitions. History page – Allows you to check all the viruses and spywares detected by MSE in you computer. Settings page – Allows you to change the settings for several option available (shown in the picture below). 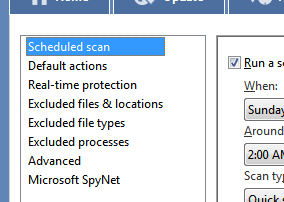 Scanning time of course could be vary depends on the user system, but for me, MSE scanning time is very acceptable, although I do not have any other program to test about. It treated me well, able to detect every viruses that I came across, especially the already widely spread removable disk viruses. And once again, due to it’s light weight and simple, it doesn’t, at least from what I see, slow down my computer start up time. Basically I can’t think of any bad things about it, as everything you can expect from a free antivirus are all there. But if talk about what it lacks, I would say Microsoft suppose to develop it into a ‘cloud anti virus’ which is using the concept of cloud computing, such as the recent released and famous Panda Cloud Anti Virus Beta, which seems promising as it is able to provide the fastest protection against the newest viruses thanks to its cloud-scanning from PandaLabs’ servers. If you feel interested to try it, you can head to here and download to try. During the installation of the MSE in all my computers, I found several problems/errors occur which eventually I am able to solve it. 1. As I am using the previously release Beta version, my MSE version was 1.0.2140, which weirdly has a higher build number than the official release (latest update), which is 1.0.1611. Thus I does not given the green light to upgrade it straight to the official build. Thus, uninstallation is needed for the beta version before installing the official version, which is actually notified by Microsoft at the MSE homepage. 2. In one of the computers, during the uninstallation of beta version, it asked me to close Windows explorer in order to continue, and of course I did. However, I can’t install the official build, the installer keep on prompting me an error with the error code of ‘0x8004FF07’. As I am using the CCleaner to uninstall it, I checked back in CCleaner and found that the software entry of MSE is still there. By deleting the entry manually, the official build installs without problem. If you ever require assistance in installing MSE in your computer, do head to the official page for MSE here, and check out the installation video. 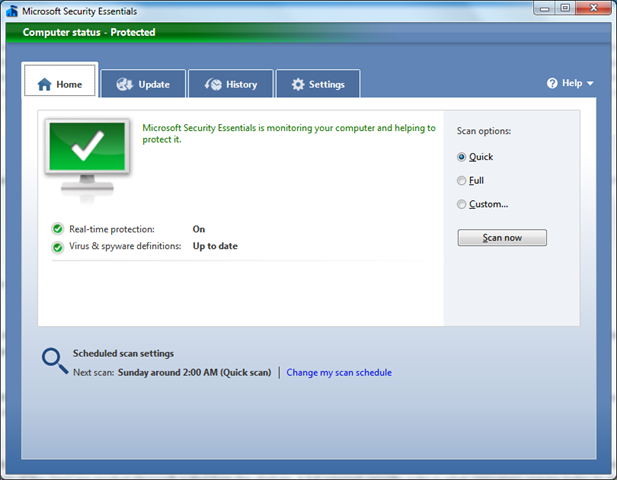 Microsoft Security Essential is a simple and fast yet effective anti virus software compared to some other free program, especially AVG and Comodo, which are ‘famous’ with their low detection rate. (It is my own experience) If you are still uncertain with which anti virus software to use, or your current anti virus (eg. AVG) doesn’t give you enough confidence to protect your computer, why not try it? You can download it here. Previous PostGive your Windows a new look with cool clock screensavers!Next PostHow to resize pictures/photos with just a right click in Windows XP/Vista/7 ?